AS Pest Control provide an efficient, affordable and professional beetle control service in Mansfield. Available 24/7 we offer a quick and reliable service to conveniently remove the beetle problem. Do I Have Beetle Infestation? Carpet beetles are the most dangerous type of beetle to homeowners. They eat almost anything. To make feeding easy they will live near food sources so can be found at the edges of carpet, around door casings and inside upholstered furniture. As implied by the name they prefer carpet but will eat furniture, leather, clothing, blankets, pet food, hair, crumbs and dead insects to name but a few. 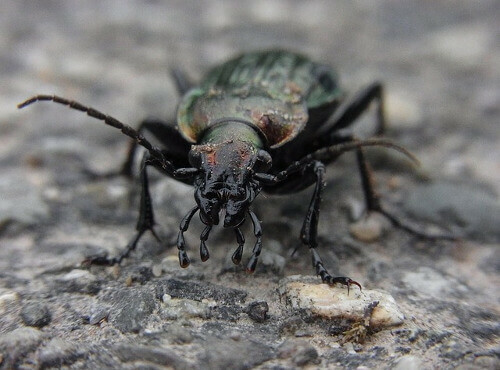 The beetles breed quickly, laying eggs as soon as they enter the home and can produce four generations each year. Other beetles include biscuit beetles, woodworm, tobacco beetles, ground beetles and many more. Contact AS Pest Control and we can provide a free onsite beetle control Mansfield quotation. If not treated beetle infestations can cause damage and increase in number. Larvae can contaminate food which is not advisable. Prior to any treatment all areas in and around infested areas should be cleaned, carpets vacuumed and furniture moved. AS Pest Control provide Beetle Control in Mansfield starting from only £60. For a free onsite survey and quotation contact us today. All insecticides are biodegradable, almost odorless, non-tainting and do not corrode or stain. They are not highly toxic towards mammals but are extremely so to all forms of crawling pests. Once treatment has been applied DO NOT wash down or vacuum the area(s) for at least 1 month or until you stop seeing dead or dying beetles or their larvae. Once this period is over it is important to be very thorough when vacuuming especially the undisturbed areas. This in itself will help prevent re infestation in the future. All areas, including carpet areas under standing furniture must be vacuumed on a regular basis. If an infestation is known or suspected, the contents of the vacuum cleaner should be disposed of immediately in such a way as to destroy the insects (or an outside bin), to prevent a transfer of infestation from one part of the house to another. AS Pest Control provide a local, affordable ant control solutions for residential and commercial customers in Mansfield, Nottingham, Derby, Chesterfield, Worksop and surrounding areas.